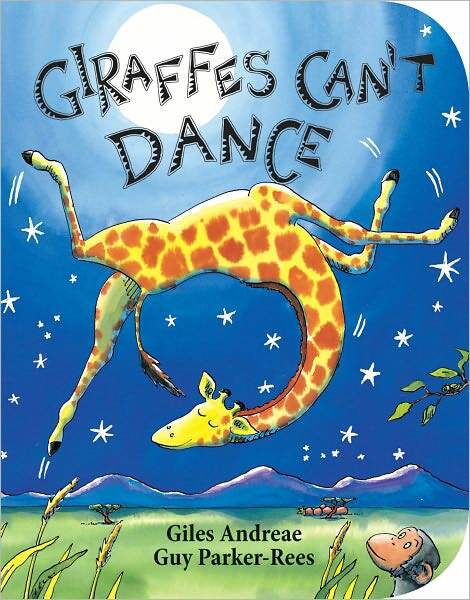 DESCRIPTION: The bestselling Giraffes Can't Dance is now a board book . Giraffes Can't Dance is a touching tale of Gerald the giraffe, who wants nothing more than to dance. With crooked knees and thin legs, it's harder for a giraffe than you would think. Gerald is finally able to dance to his own tune when he gets some encouraging words from an unlikely friend.. With light-footed rhymes and high-stepping illustrations, this tale is gentle inspiration for every child with dreams of greatness.